Must I Repair My Car After an Insurance Claim Accident? Do I Have to Repair My Car After an Insurance Claim Accident? If you have gotten into a major accident and want to continue driving your vehicle, you are often left with no choice but to repair your vehicle and happily do so. But if you have only been in a minor fender bender, you may be reluctant to part with the fat check your insurance company sends your way. Do you really have to use the money to fix your vehicle, or can you pocket it and be on your slightly dented way? As with so many insurance related questions, whether or not you are required to repair your car after an insurance claim accident depends on a couple of things. Sometimes you do not want to go through the repair process, maybe because you do not want to be without a car, or because the damage is not all that bad and you would prefer the cash. It is good to know up front whether the repair of your vehicle is required. Insurance companies all use the same basic guidelines when it comes to repairs, however, it can still vary per insurance carrier. Use these examples as a guide, but get the final say from your car insurance claim adjuster. Is There a Loan on the Vehicle? Having a loan on your vehicle basically means that yes, you need to get the car repaired -- and typically by a mechanic that has been pre-approved by your car insurance company. Your lender will want the collateral, the car, to be fully functioning and for you to repair any damages. Right now you do not own the car free and clear, so as a partial owner, it is your responsibility to get the vehicle repaired in a timely fashion. Lots of lenders require being listed on your auto policy as a loss payee to ensure you have full coverage listed on the collateral at all times. Owning your vehicle outright will give you more flexibility when it comes to repairs. An insurance company will often give you the option to repair or not to repair, to total out or buy back. Some stipulations may apply, so read below if you own your vehicle outright. After the Accident, Do You Want to Continue with Physical Damage Coverage? The insurance company will require the vehicle to be repaired if you want to continue with physical damage coverage, meaning comprehensive coverage or collision coverage. It only makes sense: the insurance company does not want to continue to insure the vehicle with physical damage once the vehicle has already been damaged. A second accident would obviously compound the existing damage and the insurance company already paid you once for the pre-existing damage. It is standard procedure for the insurance company to require you to drop physical damage coverage from a vehicle which was not repaired. Proof of the repair is usually handled by making a claim check out to both you and the body shop doing the repairs. Photos and receipts can also be submitted for proof of repairs if you do want to continue with physical damage coverage. When it comes to buying a totaled vehicle back, any major safety concerns will need to be repaired sometimes to get any coverage at all. Frame damage or blown airbags could be the reason for an insurance company to deny coverage. 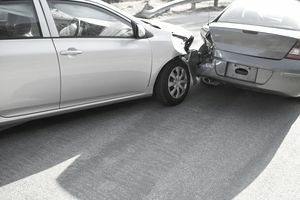 Definitely, check with your claim adjuster when it comes to insuring a previously totaled car. It is actually common for a driver to opt to not report a claim to their insurance company in order to avoid a rise in premiums. Often this would be a single car accident meaning you were at fault. Minor-ish damage occurred to the car and you want to handle it on your own. The benefit to this option is your car insurance rate will not go up due to filing an at-fault accident claim. You can afford the repair and you can handle the repair on your own time. Why report the claim if you want to pay for it yourself? If another vehicle is involved and you are required to file a claim, might as well file the claim for your vehicle too. It is tempting to use insurance claim money on other things rather than repairing your damaged car. It is especially tempting when the damage is only cosmetic and you really need the cash. Remember you are paying for the physical damage coverage for a reason. It is a good idea to get the damage repaired to keep your car’s value in line. You have invested a lot of money, time, and care for your vehicle. If you really need the cash, you can always have the repairs done at a later date. Just let your insurance agent know when the work is complete if you want to add physical damage coverage back onto the vehicle.